Chances are, with all the gadgets you see on this site and TV, you thought a fully functional pen equipped with a camera and Digital Video Recorder would be a commonplace item. Not yet. But you can be among the first to acquire this little piece right out of the spy novels. Our DV1300M Audio/Video Recording Pen appears to be a high quality, stylish writing instrument, and it is. 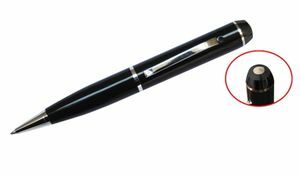 But looks can be very deceiving, because this pen also conceals a 1 mega-pixel video camera and DVR! You simply push one button and digital video begins to record onto the built-in 4GB memory chip. Slide the pen apart to expose a USB port, allowing fast downloading of data and making charging the device very simple. A compact built-in battery cell delivers power for three hours on a full charge, putting two hours of covert video surveillance at your fingertips! This unit features the latest technology that you wont find in any other DVR pen. Not only can you set it to record audio and video, you can switch over to audio only mode, motion activation, or even adjust the resolution that the device records in. Record any video and audio evidence instantly. The Digital Video Pen works as an 4GB USB drive and is plug & play compatible, with a built-in rechargeable Lithium-ion battery. The small pinhole camera can be used secretly for any law enforcement or personal covert mission. Students can also use this camcorder to record lessons and tutorials. Its highly sensitive microphone can clearly capture sounds in a 15 square meter area. Works with Mac OS as well.